The Automatic Rolling Shutters find their application in many shops, hotels, restaurants, banks, offices and so on. These are made of premium quality Polycarbonate, Aluminium, SS, Galvanised Steel etc. The Security Rolling Shutters are very easy to operate and can be easily installed as well. The Automatic Rolling Shutters provides you 100% safety and security. To cater the different needs, these are available with different specification of sizes. 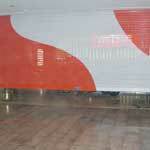 Consequently, we are enlisted among the eminent Metal Rolling Shutters Manufacturers and suppliers in India.